Last weekend, Kent, Washington played host to the 2015 American Nationals. There were championships for all three games, and by all accounts, good times were had. Amber Van Breemen won the Sportsmanship Award, based on votes cast by her fellow players. Michael Van Breemen won the Second Edition Championship and Kenneth Tufts won the First Edition and Tribbles Championships; let's take a look at what they used. See also: The original Slaby TT/ALC deck, Michael's NACC 2014 TT/ALC deck, and Ken's Worlds 2014 day one TT/ALC deck. Coin toss (quite literally). The only other deck that I was choosing between was what I was playing Day 1 as they were the only decks that I had with me. I would've changed the dilemmas slightly from the first round to the second though. Last time I saw that you used a Rom/TT/ALC deck (NACC 2014), it looked quite a bit different. What prompted the switch-up? Honestly I didn't really care what other people were playing. I knew that Amber was going to play Relativity but Ken and Justin, I didn't know until I saw the spaceline. This isn't my normal type of deck, as I prefer more solver types with more mission attempts but I've played decks like this before and I didn't learn anything particularly new. If I could use A Few Minor Difficulties against Relativity and Voyager, I totally would've :) Otherwise there's no one card that's the lynchpin to the deck, but there's nothing that I would take out of the deck either. Getting Under Your Skin, followed by Power Shift. It's probably the first time since I've moved out here that I've used a kill pile. Glad to know I can still use it right. 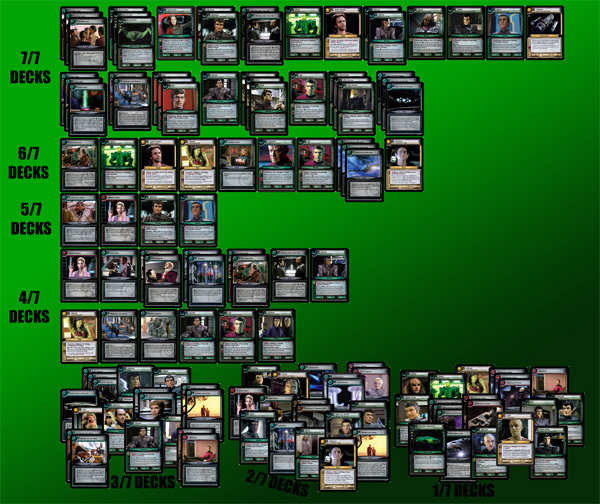 I've seen decks like this one a few times - since Stefan Slaby won 2013 Worlds with a Romulan deck using a Tragic Turn Pile and Aid Legendary Civilization (note: he used a version with an attrition pile for 2013 European Continentals), it has been common to see decks like this one at major events. Once I put together a copy of Slaby's deck for my set of playtesting decks, it was immediately obvious why these decks are so powerful and successful. They are the perfect storm of (A) card advantage through At What Cost? and easy bonus points, (B) unparalleled deck access through multiple download engines (Viceroy + Tal), (C) incredible mission solving using skill rich personnel who have plentiful stop prevention, kill prevention, cost cheating, and prevent-and-overcome abilities, (D) a 4-cost 10-range ship, and (E) passive interference with the opponent using ALC, a kill pile, and Endangered. Known issues: I accidentally left out the Worlds 2014 versions of the Slaby and Tufts decks, though those decks are largely similar to what came before. The result is that Rausmann's versions (which are similarly close to each other) are slightly overrepresented. Also, though the errata to many cards in this deck did not affect their overall usability, the changes to Straight and Steady and (more importantly) Navaar make them no longer appropriate for this deck. Navaar's abscence opens up a skill-gain hole, which is probably best filled with Silik (as Michael did here), Gav, and/or Secret Agenda. Finally, it seems I missed a copy of Surprise Party in the 7/7 row. See also: This is the exact same deck that Ken used a few weeks ago at 2015 Worlds. Why did you choose the decks that you used? What other decks did you consider using? Achievements! I played Borg for the play 10 hit, and Data of Borg casting achievement. I thought about doing Terran Empire for another play hit there, but while I had all sorts of new toys to add to the deck the errata to Multidimensional Transport Device murdered that deck. With no opposite mission to the Mirror Quadrant Headquarters planet, I would need to add to many planets, and lose some of the key battle protection in that the beam through location no longer has homeworld protection. 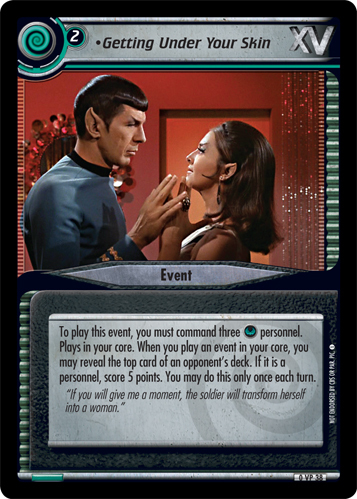 The deck would have to run 4 planets, and there's no opposite for Halkonan either and only two space, that would mean that double Kobayashi Maru Scenario decks could really wreck me at my space missions. It would take some MAJOR redesign work to keep that deck working at all and I ran out of time. I also had my Bajorans with me because I just enjoy them and they are solid. With the Borg deck I was hoping to not face ultra speed or decks that are heavily prepared for the Borg decks, but in general I was playing for achievements and fun. Winning would be more achievements so I was still trying my hardest in every game but it was not the primary goal. Bajorans I'm pretty happy with; any deck they face they have a fair chance to win, and on day two I was playing to try and win and play a deck that is more fun than Borg. I have a ton of experience with both decks. I tweaked a few things in the Borg to update it for a few newer tricks, so it was a little lighter on dilemmas. Nothing that wasn't covered in past talks about the decks, Borg had Quark's Isolinear Rods to stop Kazon or other big battle from Computer Crashing the ship download from Federation Flagship: Recovered. I never needed it, but it's tech that should be in there still in my opinion. Nothing specific in these games, it was all just a bunch of parts working together as they should. I can figure out a reason for most of the people in the deck, but I just don't know why William T. Riker is there. What's the deal with Riker? Cooks are free at the Klingon Restaurant. Ohhhh! I guess I missed Rybak too. And the Klingon Restaurant. Anyways, what prompted the switch from Borg to Bajoran from day one to day two. Was that the plan all along, or did you change your mind after day one? I got the play 10 on day 1, and I wanted to play a more fun deck that I like more; that's basically always the plan. I thought about not switching to try for the Data of Borg casting win achievement, but was able to say no to myself. I don't have much more to add about this deck - it's good. It's fast: a whole bunch of free play engines, complemented by free to play ships (including one that downloads its own staffing). It's good at solving: Dabo can mean a potential two mission win (or can at least reverse point losses), and the personnel involved come out fast and have a very high density of skills. It's safe: You can sit at your Headquarters playing Dabo, and three of your missions are in your headquarters region and are guaranteed to be close together. 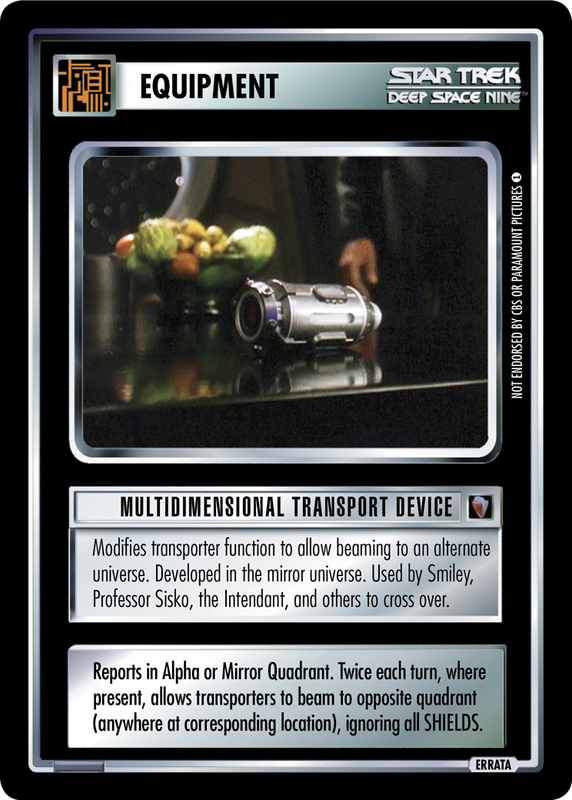 Its personnel selection isn't limited: lack of Continuing Mission or Reshape the Quadrant means that you can use high-value but non-thematic cards like McCoy or Guinan, or Backwards-Compatible powerhouses like Miss Sarda or the skill-rich, elusive Jo'Bril. After all that, if the player of this deck manages to complete Collect Metaphasic Particles, the resulting double turn and additional ability to unstop all personnel can just shut the game down right there. Much like Michael's Second Edition deck for this week, this deck just has it all. In addition to Renewal Scroll, which can't be Mirror Imaged, there are four turns of free draws from Bajoran Resistance Cell. Miss Sarda, who I overlooked last time, may not be a reliable draw engine, but she is a free draw engine, one that can also serve as a warm body for mission attempts. Anij's unique ability to delay interrupts can be a lifesaver when confronted with a game-changing Outgunned. Assign Support Personnel can dial up a Gem, providing an AU-icon Empathy personnel to help with a certain seed-as-dilemma doorway. Guess I did have something to say after all. Well, I'll close with this: when Ken used to run this deck with Kivas Fajo - Collector as the primary draw engine, I asked him why not use Handshake; it is the same in total card advantage, and can't be reflected. You might wonder the same about using Handshake over Renewal Scroll, since Handshake actually grants more card advantage and both make you discard stuff. 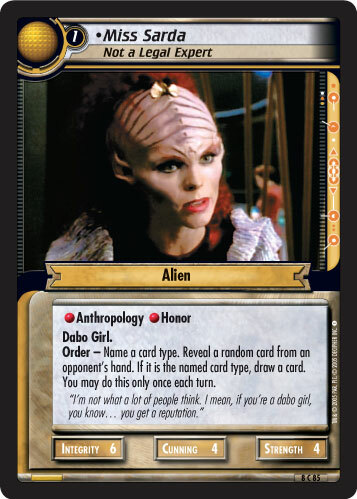 Here's the catch: the Handshake discards are not your choice, and with a bad draw, you could find yourself in the situation where you need to discard Espionage cards before you can download them for the draws with Bajoran Resistance Cell. That's all. Enjoy!